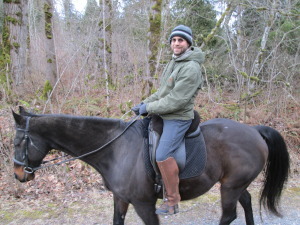 Jeffrey Blake, my husband and veterinarian, has literally figured out the answer to thousands of my questions building this site and our farm, Mustang-proofing it and everything else. Dr. Jeff riding Charlie. Married to Jeff 11 years. Married to Charlie 18 years. From Kitty Lauman, “Horses like rhythmic predictable movements,” “Absorbing the chew.” Or the importance of giving the horse time to process the training.